Former Oakland Raiders No. 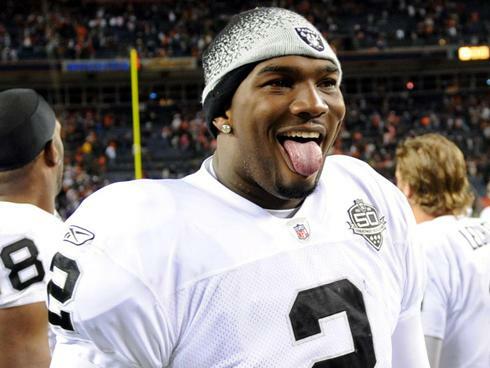 1 overall pick JaMarcus Russell gets his first shot at returning to the NFL on Friday when he visits the Chicago Bears for a workout. Russell shed 50 pounds and is now 265 pounds, same size he entered the league with. Bears had no plans to sign any of 3 QBs working out today but Jamarcus Russell did weigh in at 267 lbs. Good for him, regardless. He will be trying out for a new position as the team's pastry chef. It's a subject he knows about thoroughly. I like it. Let Trestman take a look at him and decide whether or not he's worth bringing back. No downside. Russell is known for having a poor work ethic even after losing weight I can’t see any way he will be willing to work hard enough to learn the things Trestman is going to throw at him...but at least Emery is still looking at all options. No harm in a tryout. Another QB behind Cutler couldnt hurt. The kid has big time talent but I highly doubt he can overcome his immaturity. I always hear less knowledgeable fans complaining about how the Bears need to "take a look" at guys and now I'm hearing a lot of outrage over the mere consideration of J'marcus Russell. Nothing like wanting to have to both ways, especially for a fanbase that has obsessed over terrible free agents for years. Hes lost most of the family that was dear to him and now hes a change man. Look for a brian banks type of effort out of him. It's funny how many meatheads are acting like we're signing him to a 5 year deal like, yesterday. Worst case scenario, Trestman doesn't like what he sees and we tell him thanks but no thanks. Best case scenario, he really impresses and we finally have a backup who can throw a ball more than 10 yards. Worst case scenario: We pick him up and cutler gets injured and we have to put this guy in..
See he really never had that talent though. His one great college season he had 4 NFL receivers to throw to (Dwayne Bowe, Buster Davis, Early Doucet and Brandon LaFell) plus freshman Trindon Holliday all at his disposal. That's a wrecking crew of a college offense even if Davis didn't pan out in the NFL. One thing that's always said is that you really can't become a significantly more accurate passer, and Russell was historically inaccurate in his first go around. Also of note is that future White Sox 1st rounder Jared Mitchell was on that 2006 LSU team. I still believe most of his hype is still over his pro day. IF I remember right Mayock said it was the best pro day he has ever seen, and not just for a QB. I'm not happy with it, but I can't really complain. I just hate the fact he doesn't seem to care about football, and he is too lazy to really improve. I'm not really a believer that Trestman will develop an average back up QB into a decent starter quality player. I think he sets up a more QB-friendly scheme, but I'm just not sure he will develop those without exceptional talent. If so, he would have already pushed to sign Tebow. Remember what he said before about Tim when he was the one prepping him for the Senior Bowl? "He doesn't have explosive arm strength, but he has more than adequate arm strength to throw the ball in the NFL and make all the throws," Trestman said at the time, the Morning Journal reported, via ESPNChicago.com's Michael C. Wright. "I saw him do something totally different in seven or eight days. I can only imagine what he's going to do in one year or two years, because he's going to outwork everybody else and find a way to figure it out. If you're a coach and you love coaching quarterbacks, you'd love the opportunity to develop Tim Tebow." If he really believed he could simply develop a QB he would have given a serious look at him, regardless of the zealot Tebow fanatics. Russell isn't going to outwork anyone, so what does he think he is going to get out of him? I just think it is a bit of competition for the back up before he gets cut during preseason, if he gets signed at all. The story just is getting blown out of proportion due to the major bust Russell has been so far. Oh well, in Emery we trust. Just to show how minimal the expectations are of Russell, they're also bringing in Trent Edwards and Jordan Palmer. I think Edwards is actually the best option of those three, and the only one that has a chance of supplanting McCown.